Alexander, the American tourist, decided to do Pakistan tour on rickshaw. 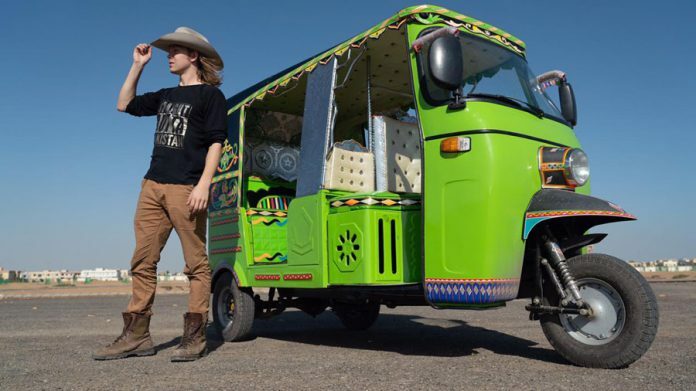 American tourist Alexander will travel throughout Pakistan on a rickshaw. He will start his trip from Karachi that will end on Khunjerab Pass, Pak-China border. However, his aim is to take something iconic to Pakistan all over Pakistan, Alexander is traveling in a rickshaw after decorating it in traditional Pakistani colors. American tourist Alexander is much amazed with his rickshaw ride in Karachi. He has already bought one for himself and he plans to take it to places it has never gone before. The best thing is that he wants PM Imran Khan to join him on the trip. He said that his biggest wish is that Prime Minister Khan tags along with him, if he (PM Imran Khan) is watching this, he wants to tell him that he would be delighted if he joins him on this trip. It is highly unlikely that a rickshaw would fare that much up north looking at the capacity of the vehicle, however, his initiative should be lauded considering it would project a positive image of Pakistan for his followers and it would definitely help change perspectives.